I thought you had to go to Costa Rica to see them. --Craig"
Roger Tory Peterson Called the Resplendent Quetzal "The most spectacular bird in the New World". Every birdwatcher I know has Resplendent Quetzal near the top of their birding wish list. All red, iridescent green/blue and white with those long tail feathers floating behind. But... You're Not A Birdwatcher? Keep reading.... 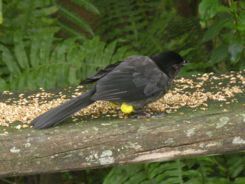 The experience of staying in the jungle and seeing jungle critters is worth it even if you're not a birdwatcher! The country that gets most of the publicity for Resplendent Quetzals is Costa Rica and the Monteverde Cloud Forest. 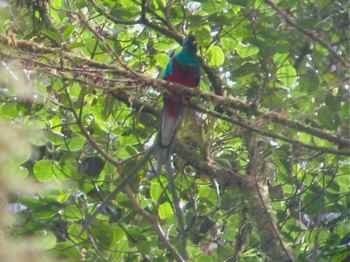 And it's the national bird of Guatemala, but we found quetzals in Panama in Volcan Baru National Park in Chiriqui Provence. You are nearly on the Costa Rican border when you're there... as long as there is a cloud forest in their range, the quetzals do not know borders. Just so we don't confuse or upset anyone, there are other species of quetzals in the tropical rain forests of Central and South America. We saw two species in Peru on a recent trip. It's the Resplendent Quetzal with the long tail feathers we want to help you find here. Remember, they only have those long tail feathers during breeding season, so you have to plan your trip at the right time of year. 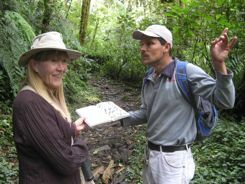 As we planned our trip, we read about a trail called El Sendero de los Quetzales...... The Quetzal Trail. It links the towns of Guadalupe which is near Cerro Punta on the west side of the volcano with the town of Boquete which is on its east. The trail skirts the Baru Volcano and can be hiked in either direction. Information we found indicated that hiking the 6 miles (9.6 kms) of this path may take from 4-7 hours. 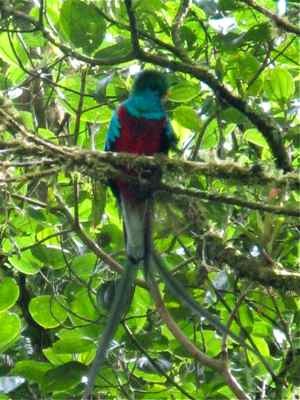 You could also look for quetzals in Panama the way we did it.... see it from your room. We drove to Cerro Punta and got one of the cabanas at Los Quetzales Lodge. Well, we couldn't resist that! Don't be put off by the fact that there is no power. The cabana are very comfortable. There are plenty of gas and battery lanterns, and lots of hot water. We ordered meals from the restaurant... took dinner with us the first night, and our guide delivered dinner the second night. And it was so much fun being alone in the jungle. 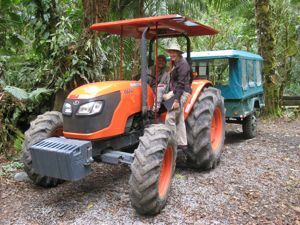 The cabana we stayed in was a 30 minute tractor ride steeply uphill into the middle of the jungle... OK the cloud forest. Then a short hike up hill. We had read that you could reach the cabanas with 4 wheel drive.... It would have to be a pretty serious 4x4 vehicle. Honestly, now that we've been there, I wouldn't try it! 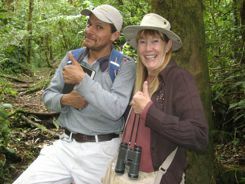 A guided walk was included with our cabana stay... and our guide found us a male and female quetzal in the first half hour. but it wasn't a 4-7 hour hike! And it wasn't a fleeting glimpse. The pair sat there for 10-15 minutes. I only wish we had a better camera so we could have gotten better photos. We also had a pair fly in and sit in the tree in front of our cabana at lunch time. Now this WAS from our room. Lucky? For sure.... but definitely spectacular! There were lots of forest birds and hummingbirds around too... 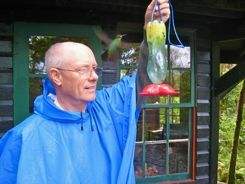 The hummingbird feeders are filled everyday, and there are several different species that buzz around you all day. 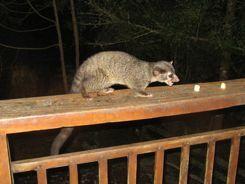 ...and little forest critters visited the cabana at night looking for bananas that are regularly put out... The lodge sent up a whole bunch that we could put out at night. 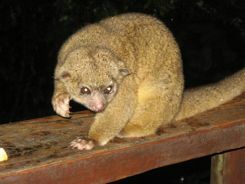 The kinkajus and Cacomistle (the Central American version of a Ring-tailed cat) were not bashful. You need to get to the cloud forest around Volcan Baru National Park. It's about an eight hour drive from Panama City on the Pan American Highway. The Via Panamericana is a four lane road as far as Santiago, then a two lane road the rest of the way. David is the third largest city in Panama, and that's what you're aiming for. 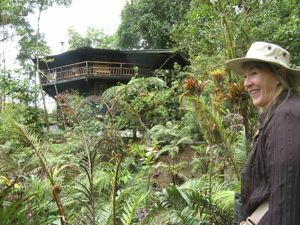 From David you have a couple of choices... you can go to Boquete which has several places to stay and resources for seeing quetzals, or you can do as we did and head for Cerro Punto and Los Quetzales Lodge. It was a long drive if you go straight through, but the roads are good. The country side is pretty, and we enjoyed it. There are plenty of interesting little towns to stop at on the way if you have more time. If you want to look for quetzals in Panama, we recommend making the effort. It's worth it just to stay in the jungle like that! We have fun traveling... and we've had fun creating this website. It earns us money too! No get-rich quick scheme here... just honest pages about our travels. Is a website something you've ever wanted to try? Are you passionate or knowledgeable about something? Turn it into a web business. Click below and learn how. It's fun... it really is. If you're like me, you like to talk to a real person and get answers to your questions... We get that!